The 5th and final e-Commerce class in Chinese was held at the SDCC on 8th November 2016. The full-house event was attended by 141 participants with 3 speakers sharing their insight and expertise in the use of social media marketing for digital companies. 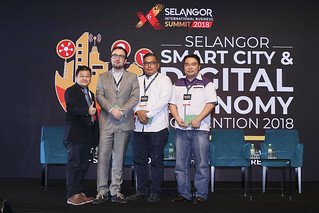 The three speakers included cacaFly Malaysia’s Consultant, Passion Chiang Pei-Hsuan; Co-Founder & COO of Asia Easy Startup, Tan Yong Ann, and CTO of SushiVid, Mak Kwan Wuey, who explored various social media platforms such as Facebook, WeChat and Youtube to roll out successful marketing campaigns. Consultant Passion Chiang of ‘caCaFly Malaysia’ started the session by stressing upon the importance of Facebook in peoples’ lives. 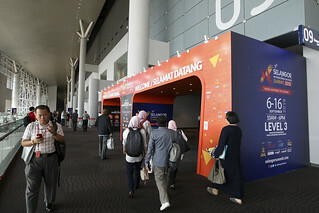 Facebook has the power to connect people virtually and what was once a micro-blogging platform is now mass-market communications and advertising platform for individuals and brands to get their message out, helping businesses to build relationships with a wider base of potential customers. She shared that Facebook’s interface is frequently revised, with new features are being incorporated from time to time, and is a great place to creatively advertise. Some of the advertising features Facebook has devised for advertisers and marketers include 10 Advertising Objectives for marketing campaigns. Additionally, using visual-rich media such as photo carousels and GIFs are effective and affordable tools to increase impressions and engagement with fans. Another creative offering by Facebook is the addition of the interactive and creativity-inducing 360-degree image feature, which advertisers can use as well. Aside from typical demographic targeting options such as population, geography and interest, there are other parameters that can be set to achieve the core advertising goals in Facebook ads, advertisers can also upload their company database in terms of members name, email, phone, etc., and use Facebook account to advertise on. Advertisers can also know more about Facebook users, such as their browsing behaviour on Facebook. Through the results of data analyse in their ads, advertisers are able to remind users to place an order or recommend goods or services to other similar users, which could increase the conversion rate. Where do you think the most populous place in the world is? 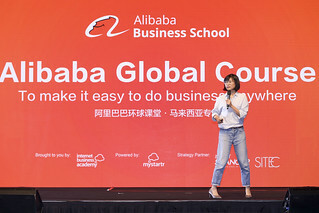 The answer, according to second speaker Tan Yong Ann, COO of ‘Asia Easy Startup’, is actually Facebook, which has a whooping 1.6 billion users, more than the population of China, the largest and most populous continent in the world. Following this is the China-based multi-purpose social platform, WeChat, coming in at respectable 800 million users. Contrary to popular belief, WeChat is not just popular in China, but Malaysia too, as 85% of smartphone users in Malaysia use or have the WeChat app installed in their smart devices, with Malays being the largest demographic of users of the app. According to Tan, there are several features Malaysian businesses should be aware of. Firstly, they ought to use a proper WeChat account name, which should not be arbitrarily changed. Features such as the group chat and WeChat Moments are interesting avenues to directly reach users. The audience participated in playing the ‘Shake’ game, which demonstrated how an interactive game of WeChat could be a major selling point in social marketing. Tan advised that businesses should utilise all the different features of WeChat in order to optimise their marketing efforts. Presently, setting up an official WeChat account in Malaysia (similar to Facebook fan page) requires a registration fee. With that, it will remove limitations such as a max of 5,000 friends on the account will be removed, and a cool auto-reply feature will be accessible as well. Official accounts can also customise buttons with functions; for example, the AiFM WeChat official account has a radio button to their function list, making it easy to listen to their station within the App itself! In China, sellers commonly add on features for users to check the status of their delivered goods. Such value-added features have managed to propel WeChat to become a central hub for users and companies to conduct their business and fulfill lifestyle needs within a single ecosystem, making it highly convenient for all parties. As such, there is a huge market of business opportunities for both businesses and Youtube Personalities (aka Youtubers), called Influencer Marketing. These content creators possess strong and individual personalities and styles, and, through their popularity and influence on consumers, can greatly help businesses increase their visibility and promote their brands and services. The popularity of a video creator (or Youtuber) is based on their own creativity, film production capabilities and personal charm. Businesses that engage the services of a Youtuber will find that often, the content of the video will be determined by the Youtuber themselves, with the cost often commensurating with the number of subscribers the Youtuber has. This is in contrast to traditional advertising, where the client controls a lot of the aspect of the advertising campaign such as details and information. Hence it is important to choose the correct type of Youtuber to promote one’s brand, and take into account each Youtuber’s areas of expertise and target audience and whether these fit with your brand’s ethos, image or product suitability. Companies dealing in B2C products and services such as beauty products, fashion, consumer electronics or even food establishments can consider Youtube Influencer marketing due to the nature of their products and services. Mak encourages shopping around for suitable Youtube channels and comparing various types out in order to see which is more effective for your particular brand’s products.